Introducing the next generation of energizer for smaller electric fence systems. With a choice of five models, the Speedrite 1000, 2000, 3000, 6000i and 12000i can handle electric fence applications up to 80 hectares, or 120 km of multi-wire fence line. 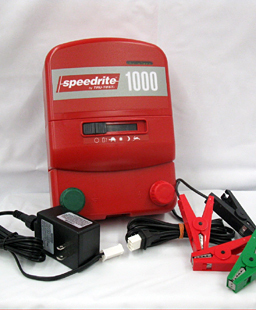 Next generation technology means that the Speedrite Unigizer can be used as a mains, battery or solar powered unit. The result? More flexibility, less fuss. All purpose Speedrite Unigizers are the first electric fence energizer to use a unique switch mechanism to control the energizer�s functions. This means no more mechanical switches connecting through the case where water and other contaminants can damage sensitive electronic components. This improved protection means unquestioned reliability - No nonsense, no problem. Performance: Each model delivers among the highest levels of performance in its class with enough power to handle electric fence applications up to 80 hectares or 120 km of multi-wire fence line. Reliability: With the electronic circuitry encased in a polymer gel the Speedrite 1000, 2000, 3000, 6000i and 12000i models are completely sealed for the ultimate in weather protection. This means greater reliability without compromising performance. Design: New generation design means that you no longer need several different energizers to meet the requirements of modern farming. Just one will do it all. The new Speedrite Unigizer range represents a significant advance in energizer construction and has been designed specifically for smaller farms and lifestyle blocks. Convenience: The new Unigizers provide mains, battery or solar power convenience as well as an enviable list of features including a 5 light LED bar showing output voltage and battery condition as well as adjustable pulse speed for improved battery conservation. Each new model also includes a fence lead set, a power adaptor for mains powered installation and a battery lead set.